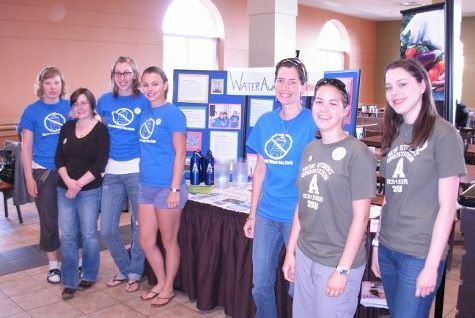 Water Watch Acadia students and Acadia Eco-Leaders promote tap water in the dining hall during orientation week. Each year with the support of the Sustainability Office students raise awareness about water related issues on campus. Here are just a few examples of student initiatives. Students In Free Enterprise (SIFE) working with students in engineering designed and built a cheaper alternative to commercially available filtered water fountains. This project, led by Acadia student David Patterson, won the Nicol Entrepreneurial Award worth $5,000. 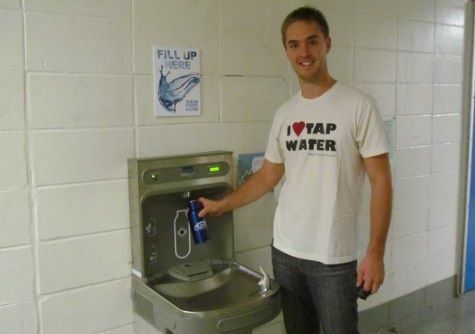 William Roberts started a campaign to highlight drinking fountains on campus. Look for Fill Up Here signs indicating safe drinking water sources on campus. He also raised funds for the installation of a new fountain on campus designed to easily accomodate reusable water bottles and track the number of refills. Numerous water conservation projects have been implemented on campus over the years. Low flow shower heads and toilets are installed in residences to reduce water consumption. Waterless urinals are installed in the new biology building as part of the LEED certification process. This project also included a rain water system used for flushing of toilets. Other improvements to building systems and fixtures are ongoing to reduce consumption. You can help too by reporting leaks and reducing water use when washing hands, showering and doing laundry on campus. Another significant water saving feature at Acadia is the installation of artificial FIELDTurf made from recycled tires and sneakers on Raymond Field. A typical soccer or football field can use up to 3.5 million gallons of water each year. FIELDTurf requires no mowing, seeding, fertilzing or watering. Read more about FIELD Turf at Acadia.